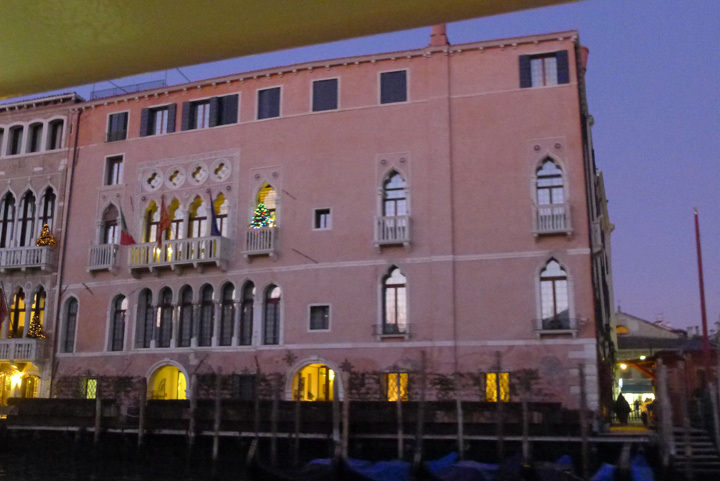 Venice is a magical city, with the water rising right to the buildings, but with Christmas lighting it becomes even more beautiful. The tiny Christmas tree lots spring up near the canals where the boats arrive to bring them. The days are short and by 5 p.m. the lights are on for Christmas. The store windows are decorated with bright reds and greens and the city takes on a festive if chilly, damp air. 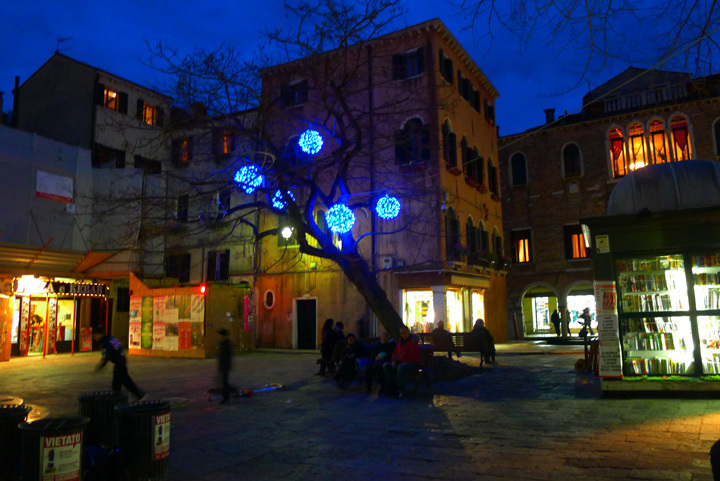 The tree pops up in San Marco and near the Basilica.I prefer this one to the metal and lights one nearer the lagoon. It’s beautiful at night but in the daytime is too harsh. A closeup of the Presepio (Manger Scene) beside the tree. 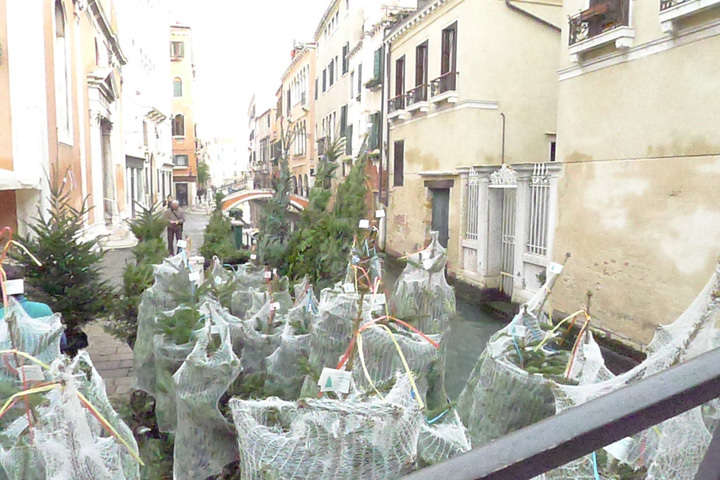 Christmas trees have not always been a part of the holiday experience in Venice. My friends had never had one in their home until recently. From Brescia, my friend remembers her father taking the train into the mountains and coming home with a tree once when she was little. But seeing this little tree lot, on Strada Nova near the Coop (Supermarket) shows how things have changed. And now on the vaporetto you may see a tree heading to a Venetian home. In the dark nights, they love their lights and many streets have them overhead. 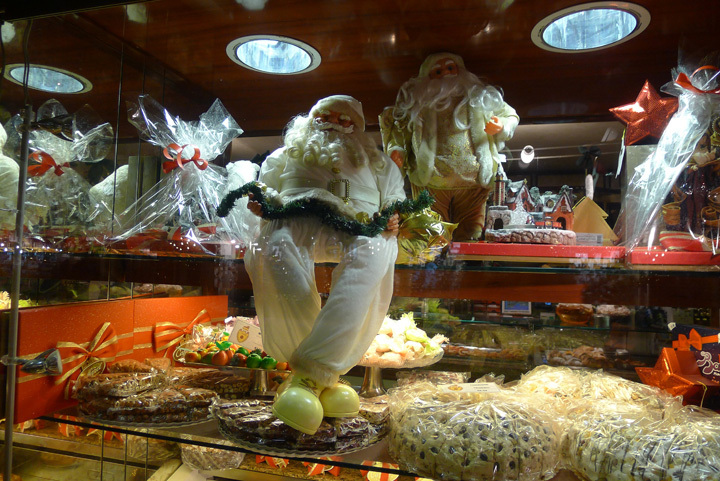 Murano is decorated as well with the store windows trimmed and lights over the canals. 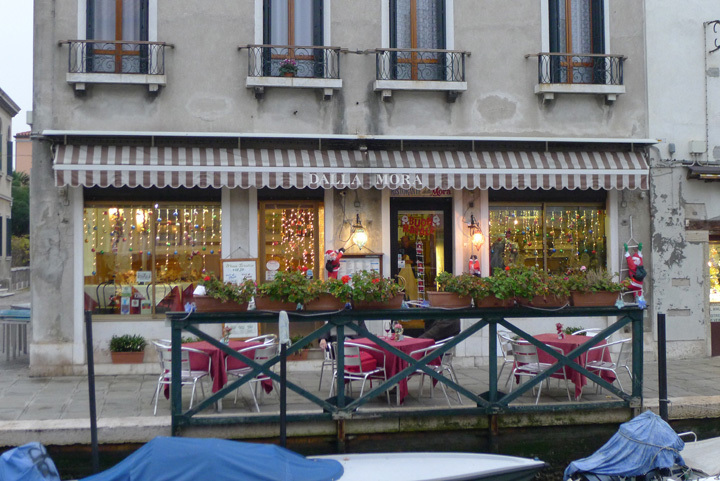 And looking back from Venice on Fondamenta Nova to Murano, my favorite bar Algiubagio – for morning coffee, afternoon aperitivo and dinner with jazz. In the eating on the deck is a joy but in the winder we just enjoy the lights where they have turned the umbrella into trees. 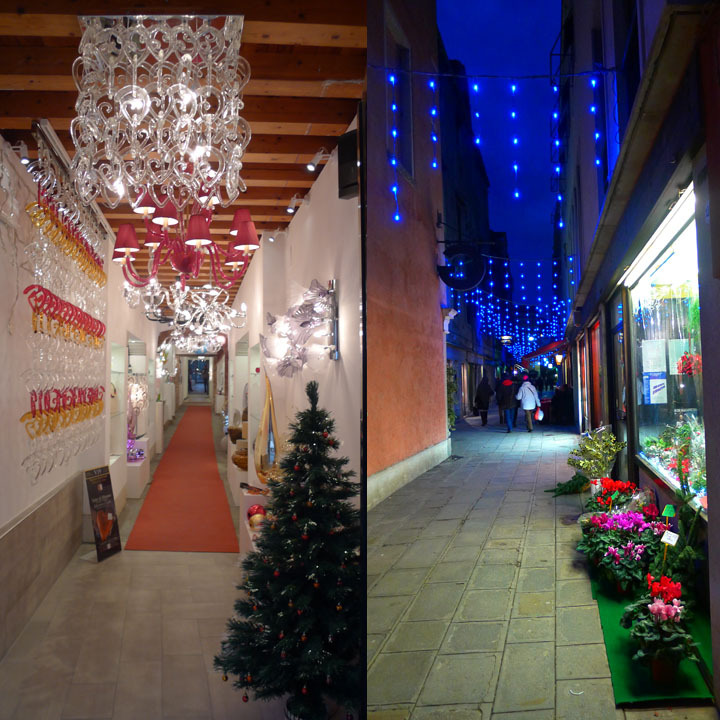 And a couple of shops decorated, a glass factory Murano and a florist on the way back from Fondamenta Nova in Venice. And if you are headed out of town on the train or bus, there’s still some holiday spirit across from the train station in the hotel windows. Wishing everyone a happy holiday with friends and family. What a lovely description and photos. Well written and Happy Xmas to all at the shop. Thanks Renata and the best to you! That sounds great. Will have to give it a try! It looks stunning.Thanks for sharing,and have a wonderful,holiday season. 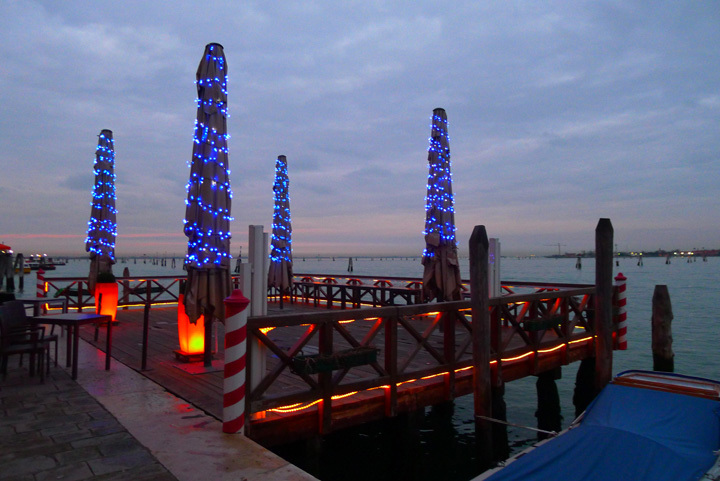 Grazie for sharing your descriptions and lovely photos of. 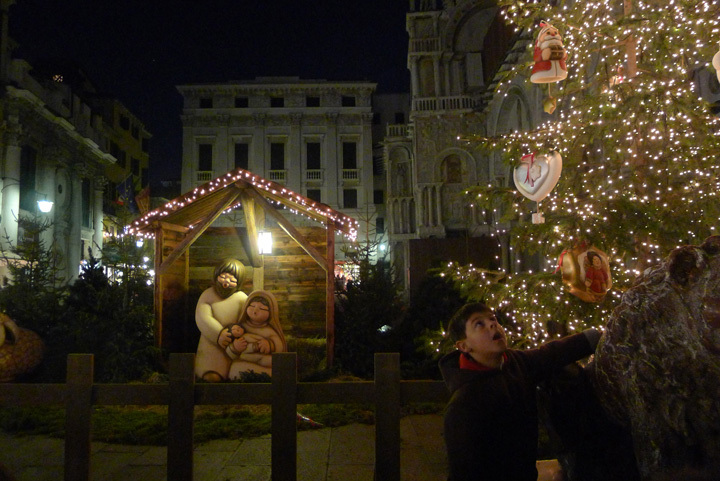 Christmas in Venice. 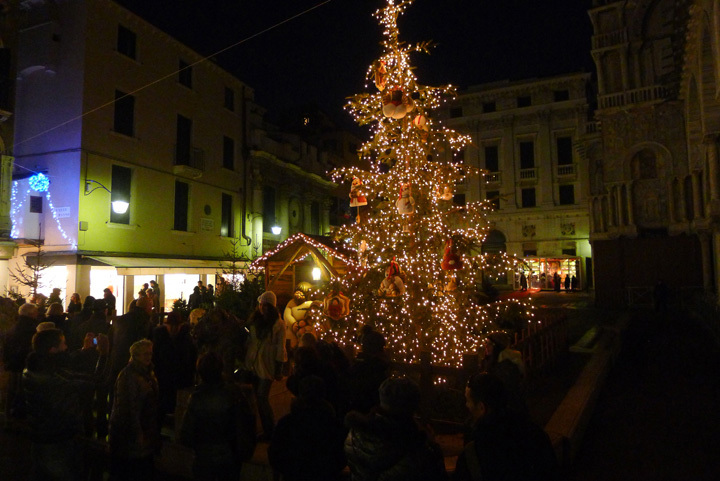 What is the daytime temperature in Venice at Christmas? The temperature varies by year. So always best to check before you go, but the temperature ranges between 35/45 degrees. However a few years ago, there was ice everywhere on Christmas eve. The humidity on the lagoon makes it feel colder than the temperature.